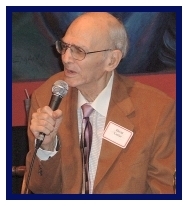 David Simon Canter (1923-2004) was a Chicago lawyer, journalist and activist - the son of Harry Canter. He was married to Miriam Canter. 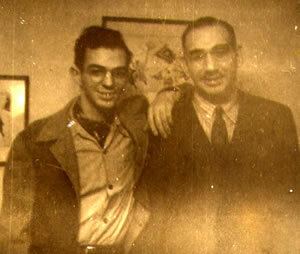 He is survived by his sons Marc Canter, Evan Canter and a daughter, Anna Pincus. His friends included fellow Hyde Park resident Sydney Bild. Born in Boston, David Canter was the son of Harry Canter, an activist with the Industrial Workers of the World who later became secretary of the Boston Communist Party USA. Harry Canter later moved to San Fransisco, where he remained active in leftist causes. David Canter however remained in Illinois. David Canter attended Wright Junior College and edited its student publication before attending the University of Chicago. 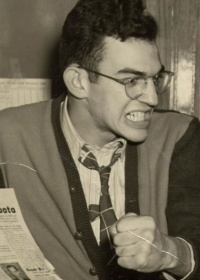 David Canter, studied at the University of Chicago and was very much involved in student journalism and politics. In 1948 he was the "left's choice" for editor of the University of Chicago student newspaper "Maroon". In 1958 David Canter graduated from the John Marshall Law School, but he began his law studies at the University of Chicago, where he earned a bachelor's degree in 1947. At some point during his long school career, David Canter ran afoul of Edward A. Levi, Professor of the Law School. Probably because of his controversial activities as editor-in-chief of the Maroon and/or his Party activities. From there to the John Marshall Law School. In the late 1950s David Canter also edited the Packinghouse Workers Union newspaper "Champion" newspaper. The Union was controlled by identified Communist Party USA figures such as Abe Feinglass, who was linked to future Chicago Congressman Charles Hayes. By 1960 David Canter had teamed up with well known Chicago Communist Party USA member, LeRoy Wolins. The pair owned a company called Translation World Publishers, which specialised in publications from and about the Soviet Union. The company soon attracted the attention of the House Un-American Activities Committee, which suspected Canter and Wolins of being conduits for Soviet propaganda. In a report prepared by the House Committee on Un-American Activities, May and July 1962 entitled "Communist Outlets for the Distribution of Soviet propaganda in the United States" David Canter was heavily quizzed about payments his company received from the Soviet Union. After the U.S. Government demanded that Translation World Publishers register as the agent of a foreign power, Canter de-registerd the company. Translation World Publishers was an outlet for the distribution of Soviet propaganda...this publishing house was subsidized by Soviet funds and was created by known Communists to serve the propaganda interests of the U.S.S.R. In June 1980, David Canter stood as a candidate for the position of Chairperson at the Annual Convention of the Independent Voters of Illinois-Independent Precinct Organization. The HouseCommittee on Un-American Activitiesalso questioned David Canter about his membership of the Communist Party USA. When identified on oath as a member of the Communist Party, by former Party member Carl Nelson of Chicago, David Canter refused to answer the charge. In 1963/64 the Soviet Union actively tried to undermine Republican presidential candidate Barry Goldwater, in favor of Democrat Lyndon Johnson. Goldwater lost the election paving the the way for Johnson's massive expansion of Federal Government power-the "Great Society". A 1963 booklet claimed that Goldwater was conspiring with the John Birch Society to organize a "putsch," or violent insurrection, to take over the United States in 1964. The booklet, "Birch Putsch Plans for 1964", contained no address for the publisher, Domino Publications. The author used the not-veryimaginative pseudonym, "John Smith, as told to Stanhope T. McReady." There was nothing to tie this publication to the communists until an ad for the book appeared in the pro-communist National Guardian for April 25, 1963, listing the publisher as "Domino Publications, Suite 900, 22 West Madison Street, Chicago, Illinois." Canter marched with Martin Luther King, Jr. in the 1960s West Side open-housing rallies. In November 1967, David Canter and his wife Miriam Canter signed a Chicago Committee to Defend the Bill of Rights advertisement in the Hyde Park-Kenwood Voices opposing efforts by Senator Dirksen to re-institute the McCarran Subversive Activities Control Act of 1950. In April 1968, David Canter signed an Advertisement in the Hyde Park-Kenwood Voices as a committee member of an as yet un-named organization led by Ruth Adams, Timuel Black, Rev. E. Spencer Parsons, Al Verri and Rabbi Jacob Weinstein asking the question, "What can you do to get a real choice for president in 1968?" Canter helped organize the 1968 Chicago Democratic party convention protests. David Canter later edited the Packinghouse Worker’s Union’s Champion, Hyde Park-Kenwood Voices, and former Chicago Mayor Harold Washington’s “Second Term” newsletter. He also printed dozens of newspapers on behalf of Chicago politicians. By the late 1960s David Canter was working as an insurance agent and publishing a small politically oriented Chicago neighbourhood newspaper, the Hyde Park-Kenwood Voices. Canter's partner and the paper's editor was Don Rose, a journalist prominent in the Communist Party USA front Chicago Committee to Defend the Bill of Rights-which was established to abolish the House Committee on Un-American Activities. David Canter's late wife Miriam Canter was of similar mind. She was an active fundraiser for a defense committee for prominent medical researcher and accused Communist Party USA member, Dr Jeremiah Stamler who was also under investigation by HCUA. After the Hyde Park-Kenwood Voices folded, Don Rose and David Canter became mentors to a young journalist named David Axelrod. In his early years as a political consultant, Axelrod, following in the footsteps of his mentor, the political strategist Don Rose, carved out a reputation for himself as a skillful specialist working for local progressive candidates...says Rose. "I think he's a principled, generally progressive guy... ."
Axelrod first met Rose and Canter in the early 1970s while studying political science at the University of Chicago and working as a reporter on the Hyde Park Herald. Canter and Rose took the young David Axelrod under their wing. They took it upon themselves to "mentor" and "educate...politically", a the young journalist. Don Rose later wrote a reference letter for Axelrod that helped win him the internship at the Chicago Tribune which launched his career. David Axelrod did not work for the Voices at any point. He was a reporter for the HP Herald while attending U of C, appearing on the scene first in 1975, just after the Voices folded–but he was familiar with our paper as a student before he got the Herald job. Your dad and i “mentored” and helped educate him politically in that capacity, which is perhaps why you may recall seeing him hanging around the house. I later wrote a reference letter for him that helped him win an internship at the Tribune, which was the next step in his journalism career. David Canter knew Harold Washington for many, many years, before he was involved in politics, and was key to putting together his mayoral voter registration strategy, consolidating the black vote. Canter was always very involved in elections and election law. That’s how he met most of the African American and progressive candidates on the South Side. He would review their petitions to see if they would stand up to challenge. Candidates would come to the Canter's home with petitions and pile them on the dining room table. David Canter would go over them line by line. David Canter played a key role in persuading Harold Washington, his friend of 20 years at that point, to run against Richard M. Daley in 1983. Washington accepted the proposal. His vacant congessional seat was taken up by Charles Hayes, the identified Communist Party USA member once close to Canter's old Packing House Workers Union colleague, Abe Feinglass. David Canter's most famous publication was a slick, 1980s tabloid called Second Term that touted the late Mayor Washington's administration. Mr. Canter was Washington's deputy streets and sanitation commissioner. The newspaper attracted scorn in the mainstream press because it was funded, in part, by donations from city contractors. On May 17 1983 David Canter was a Panelist on A New Mayor and New Politics forum at Chicago State University Auditorium. The election of Harold Washington as Mayor of Chicago was more than one man's victory. It was a progressive people's declaration. The Black community and progressive Latinos and whites formed an unbetable force in a campaign for justice and equality. Panelist were Paul Booth, Juanita Bratcher, David Canter, Slim Coleman, Danny Davis, Keith Davis, Ron Davis, Ishmael Flory, Rev Harry Gibson, Nancy Jefferson, Richard Newhouse, Lu Palmer, Art Vasquez, Conrad Worrill sponsored by Black Press Institute and Independent Citizens Alliance. On April 6, 1983, the Hyde Park Herald published an endorsement from the Hyde Park/Kenwood Citizens Committee of Democratic Party Chicago mayoral candidate Harold Washington. Signatories to the endorsement included David Canter and Miriam Canter. ON November 16, 1989, David Canter served on the Tribute Committee for the Chicago Committee to Defend the Bill of Rights Tribute to Leon Golub and Lucy Montgomery, held at the Congress Hotel, Chicago. David Canter worked for the election campaigns of Bobby Rush, Carol Moseley Braun and dozens more. David S. Canter served as an advisor to prominent Chicago politicians, including Harold Washington, Carol Moseley Braun, and Bobby Rush. Don Rose and David Axelrod also worked for Harold Washington. Rose served as an adviser to the Mayor, while Axelrod served as a campaign consultant. A Christopher Hayes article in The Nation February 6th 2007 touched on the links between Washington, David Axelrod and the later emergence of Barack Obama. Twenty-one years later, when Barack ran for the U.S. Senate in the primary against six very strong candidates, he carried every ward on the northwest side except one, and carried the ward that St. Pascal's is in...That's what he was thinking about on primary night. I was thinking, and I told Barack, that Harold Washington is smiling down on us." While Harold Washington died shortly after starting his second term, the coalition that elected him endured, electing Carol Moseley Braun to the U.S. Senate in 1992 and Barack Obama to the same seat in 2004. When longtime Communist Party USA associate Carol Moseley Braun ran for U.S. Senate from illinois in 1992 the "Washington coalition" swang back into action. While the communists and socialists worked on the ground, Canter, Don Rose and David Axelrod played senior roles in the successful campaign. Barack Obama ran the the highly successful voter registration drive that secured Moseley Braun's victory-possibly where Canter and Obama first met. David Canter knew Barack Obama through Independent Voters of Illinois-Independent Precinct Organization. David Canter had become active in the organisation in the 1940s and remained involved up to his death in 2004, serving on its board in the early 1980s. IVI was set up to campaign for endorsed candidates-especially "progressive" candidates, which caused the FBI to investigate the organization . The government took an interest in IVI as far back as 1944, over quite justified allegations of communist infiltration. Both Barack and Michelle Obama were members of IVI-IPO and the organisation endorsed Obama during his 2004 U.S. Senate race. DSA member Timuel Black and Socialist Party USA veteran Leon Despres DSA and Progressives for Obama member Betty Willhoite, David Orr, Carol Moseley Braun, David Canter and Barack Obama. David Canter died a month later. David Canter served as former Mayor Washington’s Deputy Streets and Sanitation Commissioner, an aide to former Governor Dan Walker, and an attorney for the Illinois Commerce Commission, and right up to his death, he served as an attorney for the Cook County Department of Human Rights; he was especially devoted to heading up a revamp of the Miriam G. Canter Middle School, named for his wife following her death in 1999, and served as a member of the Friends of Miriam G. Canter Middle School. This page was last modified on 30 March 2019, at 05:49.